Garlic Hanging under a tree, out of the sun to dry. October….My favorite month! Why? Because this is the month I wait for all year. This is the month of GARLIC! Who can live without garlic. Not just to eat it, but to plant it, grow it, nurture it, watch it, harvest it and braid it! With out a doubt Garlic IS my most loved crop. When I first started growing garlic about 18 years ago, I planted just 3 or 4 varieties to start with, but since learning about garlic and the hundreds of varieties, I have grown as many as 41 varieties at one time. I have kept careful garlic “logs” of which does the best in my area, which does not and I am always looking for new and unusual types to grow every year. The magical date this year for planting my garlic will be on October 12th. Why then? Because it’s a full moon. I like to plant by the constellations when it comes to root crops and garlic especially. This year I will be planting 31 varieties. Now of course, planting about 150-250 cloves of each variety, around 6,00 cloves total, will take some time and not all will be able to be planted on this date, but I really try to get them all in within a few days of the full moon. I would love to plant acres if only I have the space! Over the years I have learned what makes the best tasting and the biggest garlic bulbs. Good soil with good drainage is the first thing you need. If you want good garlic and your soil is hard and compacted you may want to plant a cover crop and skip the first year to work your soil into a loamy haven. 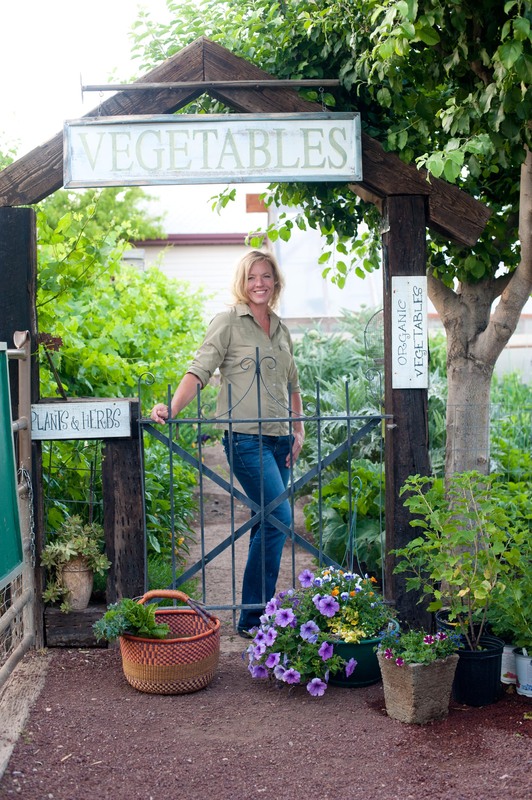 You can add vermiculite or perlite to your soil to increase drainage. Peat Moss will help retain nutrients and moisture. AND… never forget to compost, compost, compost! Yeah, I know I’ve never said that one! Garlic likes a neutral pH range. 7.0 is best. Garlic also likes nitrogen, so I always add Blood Meal or Feather Meal to the soil when planting. Both work equally well. 10 pounds per 100 square foot. With winter coming up the nitrogen will last until early spring (when the garlic starts to grow again) and at that time it will need another feeding of nitrogen. Another thing that I add when planting is Greensand or Azomite. I do not add any phosphorous. As strange as it may seem, garlic does not respond to phosphorous, so why waste it. Turn the soil over well and let it settle for a day before planting. Pull the cloves apart no more than a day before planting. If any earlier the garlic could dry out and wither. I prepare a Kelp Meal tea to soak my cloves in. It’s just 1/4 cup of dry Kelp Meal steeped overnight with about 1 gallon of water. 1 hour before planting out I drop 1 tablespoon of baking soda and some Humic Acid into the kelp solution and soak the garlic for only an hour. This basically awakens the garlic and the baking soda will help with any bad bacteria or fungus that may be present. time to plant! I like to have my garlic in its own space. This is about the only thing that gets its own beds or rows. Garlic does not like competition! It does not like weeds either. It’s not the only one! Ha! With the ground prepared and loose it’s easy to just push the garlic cloves into the soil about 2″ deep, pointed end up. Make sure you mark your garlic varieties with a stake. This is really important if you are growing many types. If you live in a very cold climate you may want to cover your crop with some straw or leaves till spring time when it should be removed. I skip this step here in zone 8. Water your garlic if there is not chance of rainfall. I find that I have to water a couple of times a month. But I do live in a dry area. The little cloves need to get their roots started to hold them into the ground if it freezes. 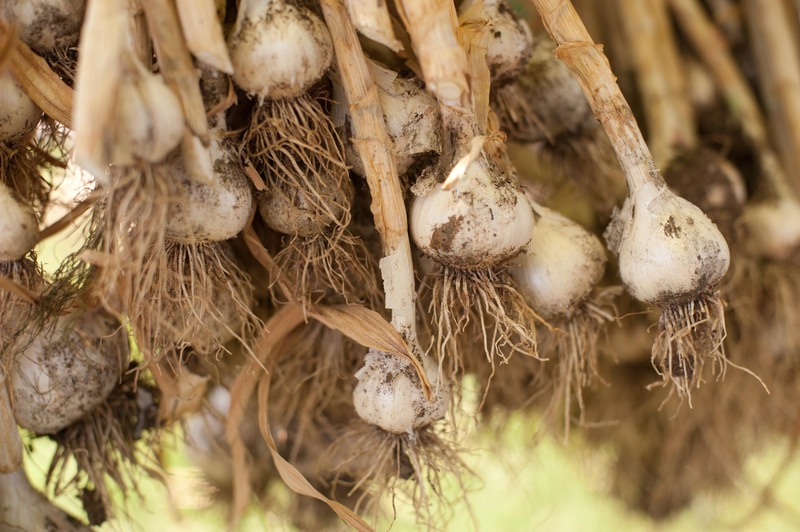 Planting garlic late in the season sometimes will result in the roots not getting hold and when the ground freezes it can heave up the cloves and damage or kill them. Planting to early the garlic tops can get to big and get damaged by the freezing temperatures and cause the garlic to become smaller than it would have been. So that is why October is the happy medium. Around here our harvest time is mid-June, but further north they harvest towards the end of July. So just giving a “date” won’t work of when to harvest. There are some signs to look for. Hardneck varieties will grow a scape. This is a flower head trying to form. When the scape first comes on, it will be curly. Sometimes it will curl a couple of times. Cut these scapes off and use them for garlic scape pesto or roast them. They are delicious! The more curls the better and more tender. Once they start to straighten they become tough. Anyway, leave just a couple of those scapes as an indicator of when your garlic is “ripe”. Once they have straightened up, it’s time to harvest your hardback garlic. What a great and easy sign! With softneck garlic they don’t form a scape, so you have to watch the foliage. Once the top 1/3 of the garlic leaves start to brown the time is near to harvest. Some years I have found that I had to wait just a little longer, so I cheat. I dig around the base to see if it has bulbed up. This isn’t illegal! You don’t want to wait to long to harvest because the paper around the garlic will start to decompose and then the garlic will not keep well. Be careful to not bruise the garlic. Bruised garlic never keeps as long. Lift them out with a digging fork and hang to dry out of the sun. The sun will scald the garlic making them unusable. Soft neck varieties can keep for up to 10 months, whereas hardneck only keep up to 6 months. Save your biggest bulbs for next October’s plantings. Store them in a cool place, but not the refrigerator. Braiding softneck varieties and hanging seems to help keep them. I always have 3 or 4 braids in my kitchen. Just pluck one-off the bottom as needed. The braid will hold it’s shape. I store hardneck varieties in the cool pantry and use them first as they don’t keep as long. Some of my favorite garlic varieties that I will always grow in my garden are Applegate, Kettle River Giant, Inchelium Red, Siberian, Russian Red Toch, Duganskij, Music, Yugoslavian Red, Metechi, Kazakhstan, Burgundy and not to mention so many others. 5 new varieties this year that I am eagerly awaiting their arrival. Elephant Garlic is another variety that I grow because it’s so huge and such a delight to lift up in the summer from the ground. Technically Elephant Garlic is not a true garlic. It is in the leek family, but I treat it the same anyway. Don’t limit yourself with just one variety. Buy from reputable companies and buy early, because garlic goes fast! Anybody can grow garlic, but growing GREAT garlic is over the top! Got it! I’m all set to prepare today and plant tomorrow, thanks for the full moon PLANTING reminder. I almost missed the special date! yikes! As my second year planting garlic, this is becoming a wonderful autumn ritual. Even my husband is getting involved.. and it’s just so EXCITING pulling the garlic out of THEIR womb (in the early summer days). lIke giving birth to LITTLE babies! LOVE IT!